Bring a smile to someone’s face by celebrating their “half-birthday” with half of a birthday cake! 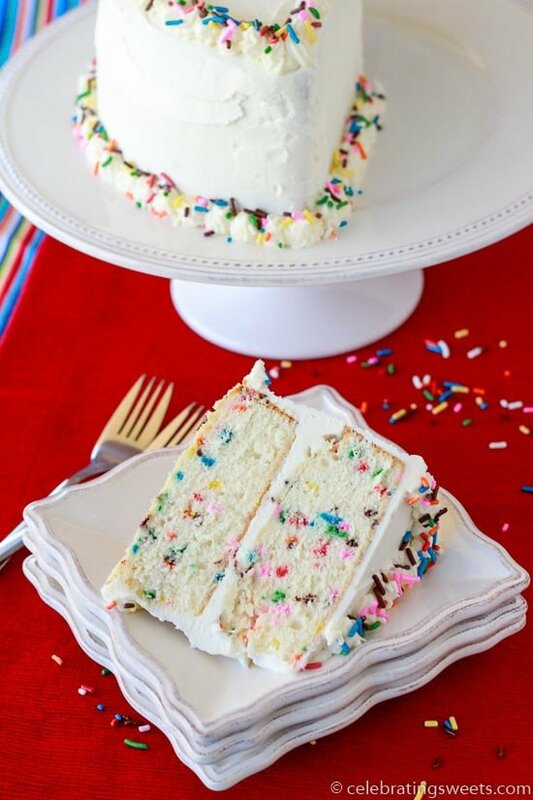 One 9-inch vanilla funfetti cake, cut in half, stacked, and frosted to make a half-birthday cake. One of the traditions that we started for our kids is celebrating their half-birthdays. At the halfway point between one birthday and the next, we celebrate with half a birthday cake and one present. It’s nothing big or fancy; it’s just our family slowing down and enjoying a small milestone. Childhood goes by so fast. Now that I have two children, I feel like someone has pressed the fast forward button on life. And since I can’t slow time down, I try to make a serious effort to celebrate each stage that my child is in. And what better way to celebrate than with cake?! Jake just had his half-birthday (he’s 3 1/2 now!). This was the first year that he (somewhat) understood his half-birthday celebration. Needless to say, he was thrilled to blow out 3 1/2 candles and eat a slice of sprinkle-filled cake. 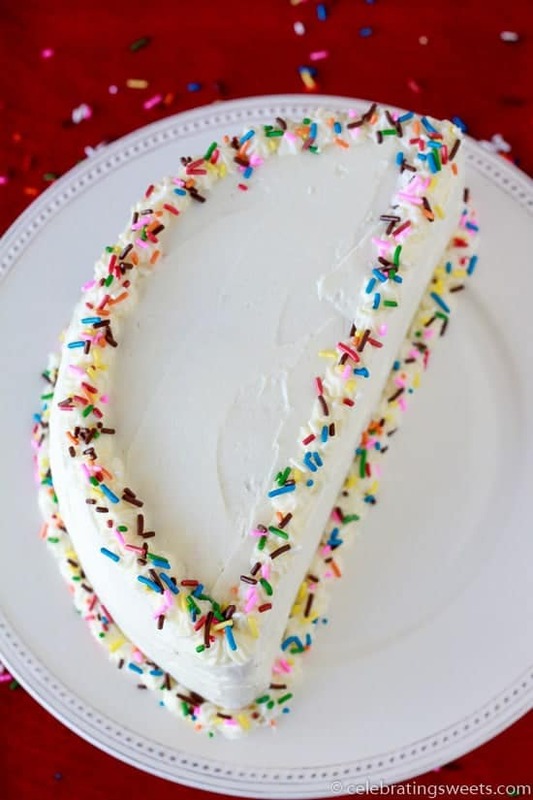 To make a half-birthday cake all you need to do is bake one 8 or 9-inch cake, cut it in half, stack the halves on top of each other, and frost them. Since Jake loves sprinkles (what kid doesn’t? 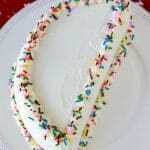 ), I made a homemade funfetti cake. A moist vanilla cake, filled with colored sprinkles, topped with vanilla buttercream, and garnished with even more sprinkles. We loved this cake, and we loved celebrating our 3 1/2 year old boy even more. If you’re not a fan of sprinkles, you can check out Jake’s chocolate half-birthday cake from last year. Bring a smile to someone's face by celebrating their "half-birthday" with half of a birthday cake! 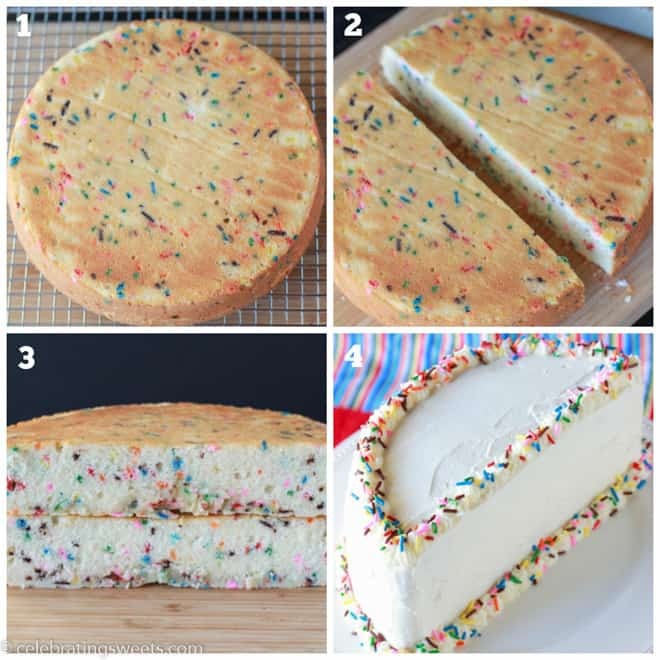 One 9-inch vanilla funfetti cake, cut in half, stacked, and frosted to make a half-birthday cake. Preheat oven to 350°F. Grease a 9-inch cake pan and set aside. In a large bowl, whisk melted butter and sugar, until combined. Add egg, yogurt/sour cream, milk, and vanilla extract, whisk to combine. Slowly stir in the dry ingredients, mixing until they are just combined. Fold in the sprinkles, being careful not to over mix. Pour the batter in to the prepared pan - the batter will be thick. Bake for 24-28 minutes, until the cake springs back when you touch it and a toothpick inserted into the center comes out clean. Cool completely on a wire rack. 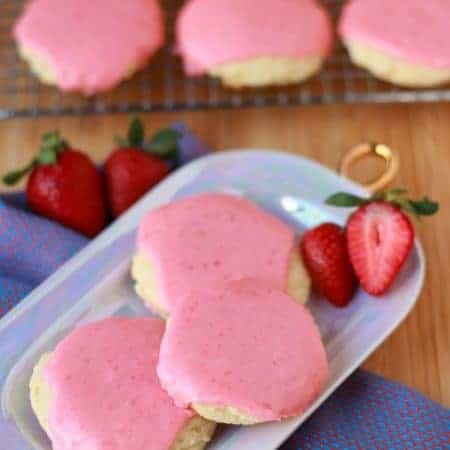 With a hand mixer or stand mixer, on medium speed, beat butter and powdered sugar for 2 minutes, until light and creamy. 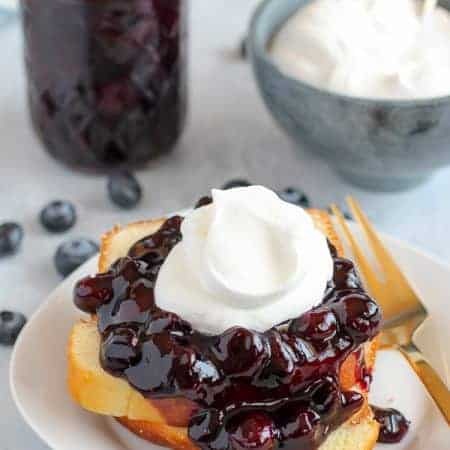 Add vanilla extract and 2 tablespoons of cream, and beat for another 2 minutes, scraping the sides of the bowl as necessary. 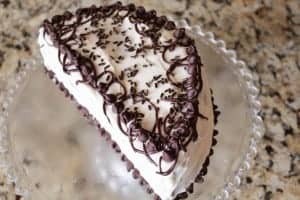 If the frosting seems too thick, you can add another tablespoon of cream. Cut the cake in half. Using a butter knife or offset spatula, frost the top of one half and then place the other half on top of it. 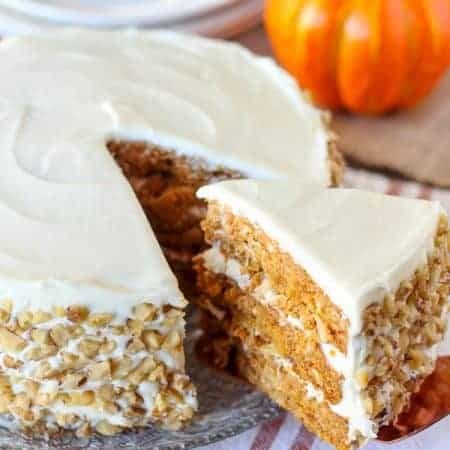 Continue frosting the rest of the cake. Pipe additional frosting around the borders, if desired. Garnish with sprinkles. Such a cute idea! We should do this with our kiddos! The recipe looks amazing too! That cake looks like the definition of perfection! I love this! So pretty. happy half birthday! This is such a cute idea. I found you through the retreat party. I am pinning this. Excellent, my new go-to birthday cake! The frosting is perfect, exactly like Betty Crocker pot from the shop. Thank you!!!! I have a customer that would like a half cake done. How stable would it be for transporting? Any chance of it toppling over? Yes, there is a slight chance that it could topple over. I would make sure that your cake layers are perfectly flat, so you’re not stacking on a domed surface. I would also recommend chilling the frosted cake before transporting so that the frosting will be firm. Can I use this same frosting if I want to put a foundant as well? Probably, although I have never worked with fondant before. If you typically put buttercream under fondant, then yes, this frosting will work.